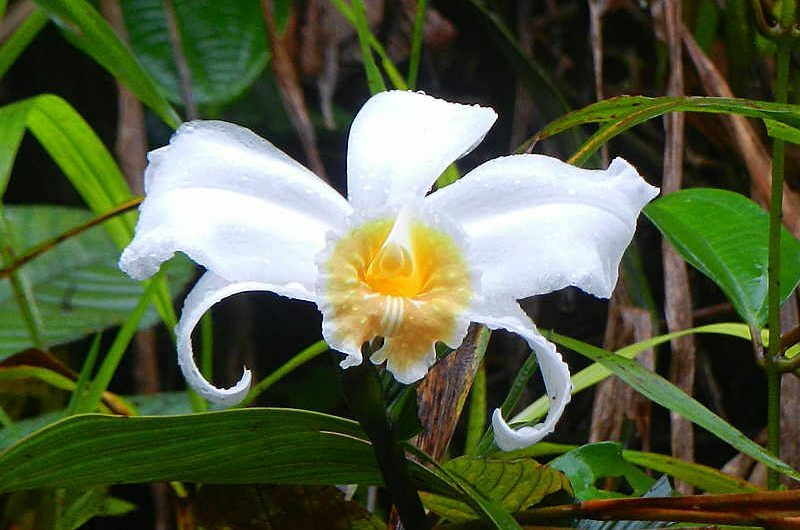 Sobralia citrea is the most common large, white-yellow orchid found along the Caribbean slope from Costa Rica through central Panama. This distinctive orchid was just recently described by American botanist Robert Louis Dressler in 2005, and is most commonly known from Panama. The genus Sobralia is very diverse and contains approximately 125 species. Their delicate flowers usually last only a few hours, as a result of a self-digesting enzyme. Flowers in this genus are small to large, and buds open synchronously within a species, likely due to an environmental cue. They have stiff, pleated leaves and reed-like stems that terminate in the inflorescence. Most Sobralia are epiphytic, but some are terrestrial, and they are pollinated by bees. Sobralia citrea is found in foothills (800-1000 m elevation), and is blooming now in El Valle near the Canopy Lodge and Cerro Azul, one of our birding destinations. For another up-close photo of the flower (and other Panamanian orchids), check out our orchid checklist.